This is general information about audio description on DVDs and Blu-ray discs. NOTE: Generally speaking, we do not separately list "Steelbook" versions of DVDs (which also contain description if the original DVD did) or compilations (e.g., 3 movies in a series, where one or more of the movies has a description track). We also try to avoid listing DVDs only available from Marketplace sellers. Online movie streaming/rental/purchase services such as Verizon's FIOS On Demand and Comcast's XFINITY On Demand plus Amazon Prime Video, iTunes or Netflix may offer audio description tracks on some movies not listed here (because the description tracks were produced for the movie but never transferred to DVD). and especially parents of blind children. Which Movie Studios Include Description Tracks on Their Videos? WRITE / EMAIL THEM !!! Occasionally or newly include description: DreamWorks (various distributors over the years), eOne (2014 only - inactive), Focus Features (Universal sub - inactive), IFC Films (late 2015 - inactive), Lionsgate (limited since 2014 - only 14% of their DVDs have AD tracks), MPI Home Video (2 we know of). From 1997-2005, only 15 described DVDs were released. The big change came in 2010 when major studios began to commit to including description tracks. Paramount, Fox, and Disney are doing very well with 86-94% of their DVDs described. Warner Bros, Sony, and Universal describe a bit over half their DVDs (54-63%), so room for improvement. Once again, Lionsgate takes last place among major studios with only 14% of their DVDs described, a terrible track record. Among the smaller studios releasing 10 or more DVDs this past year with NONE described, we have Cinedigm (10 DVDs), Magnolia (10 DVDs), and especially Shout! Factory (21 DVDs). It's time for them to step up to the plate. The Watch List (5 to 9 non-described DVDs) consists of Echo Bridge, Gravitas, Image Entertainment, and Well Go. Better start thinking about AD! In our analysis of all 437 DVDs identified by the DVDs Release Dates site and/or located in stores in 2018, only 36% (159) had description tracks. At least this was a 20% improvement over last year. 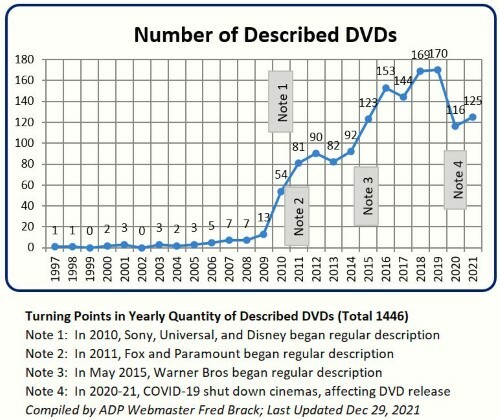 Disney and Paramount describe around 85% of their major films on DVD. Warner Bros, the last major studio to start describing DVDs, now provides description on over 75% of their DVDs. Fox describes nearly 65% of their DVDs. Universal offers the 2nd largest number of DVDs each year, but describes less than 45% of them. Sony offers the 3rd largest number of DVDs each year, but only describes about 35% of them. Lionsgate, which released the largest number of DVDs last year by far (116), described a paltry 10% of them. The studios not offering any description, yet having 6 or more DVDs during 2017 are: Shout Factory (18), Well Go (11), Magnolia (10), MPI (9), Image (6), and Broad Green (6). In our analysis of all 466 DVDs identified by the DVDs Release Dates site and/or located in stores in 2017, only 30% (142) had description tracks. With one exception, these statistics do not include videos of TV series, none of which were described on DVD. For a listing of Public Broadcasting System (PBS) described DVDs, see Accessible PBS Programs on DVD For Sale. The Described and Captioned Media Program (DCMP) provides audio described educational DVDs from their library of 5000+ titles. If you want to rent described videos, about the only chain of stores left is Family Video and kiosks like Redbox. If you want to borrow described videos, see our list of locations to borrow DVDs by state. For audio described DVDs outside the USA, see our International page. To order UK-described videos in the USA, see our Ordering UK-Produced Described Videos in the USA page. Several streaming video services offer audio description tracks, notably Amazon Prime Video, Netflix, and iTunes (links are to our listings of their described videos). Our Streaming page keeps you up to date with such services, and see our page on Accessing Audio Description on Netflix. Accessing the Audio Description Track on DVDs: With a few exceptions (such as Moulin Rouge and Up), you should be able to access the Audio Description track by pressing the "Audio" button repeatedly on your remote until you hear description (an easy alternative for users who are blind and can't navigate to the Languages menu). Disney Pixar releases starting November 2010 let you select AD when you insert the DVD, as noted in the 2010 listing. There is a software product available which will allow you to extract the audio track (including the description track) from a DVD and convert it to MP3 or other formats. This may be useful for people who are totally blind and don't need the video. For more information, see Computer Application Studio's DVD Audio Extractor, which is free to try for 30 days.